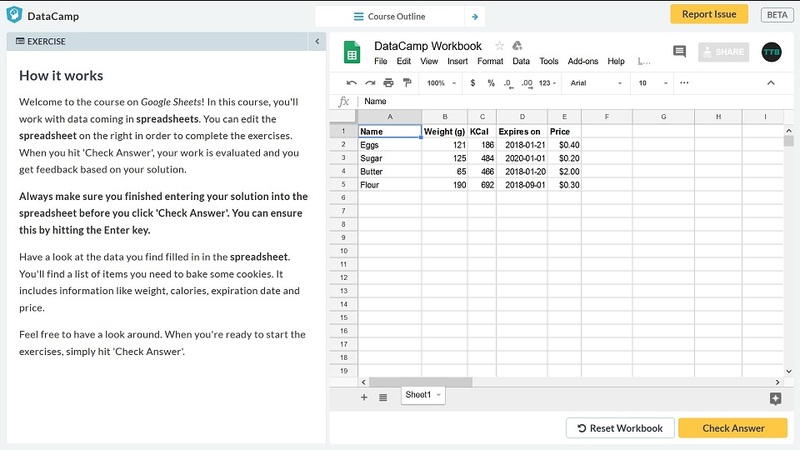 DataCamp’s Spreadsheet Basics* is an entry-level, free course to get you started with spreadsheets. It is the first in their series of spreadsheet courses which uses Google Sheets, a free online spreadsheet platform, to experiment on. Although it is focussed on Google Sheets, the same concepts can be easily applied to Microsoft Excel. 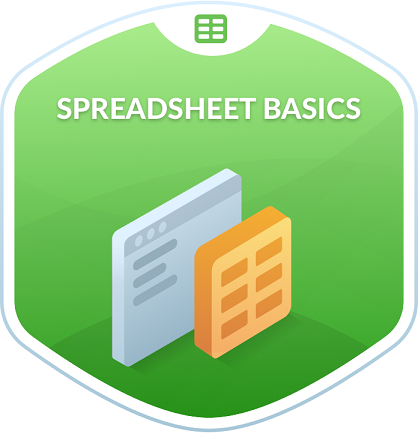 It is worth noting that Spreadsheet Basics is primarily aimed at those with no or very little experience with spreadsheets. But, don’t let that put you off. Getting started – Here you will learn some basic formula’s in spreadsheets. References – Learn how to apply formulas to specific cells. Admittedly I enrolled in the Spreadsheet Basics course with moderate spreadsheet experience already under my belt. I decided to give it a go since I discovered DataCamp has expanded its platforms to cover spreadsheets in the hope that I may learn something new. For those that are familiar with the DataCamp platform, the course is much the same with a series of interactive exercises. In this course, the platform you practise on is Google Sheets, which worked very well despite being in beta phase. Unfortunately, there are no videos on this course. But, the beauty of using Google Sheets is that you have the option to save your workbook for future reference or even download a copy to open in Microsoft Excel to continue your training. If you are new to DataCamp, then where have you been? Just kidding! Once on the course, you will see a window with split screens. To the left, there is information about each exercise, including tasks to perform, and on the right, there is the platform in question – in this case, Google Sheets. You will then work through a series of tasks by using Google Sheets. The introducing chapter starts with an example of a simple spreadsheet which contains information about some baking products. In your first exercise, you will become familiar with entering data into the sheet. DataCamp then explains some of the terminologies of spreadsheets, including rows, columns, cells and ranges. Once up and running familiarising yourself with selecting data and replacing values, the next exercises require you to use formulas. Formulas are the bread and butter of spreadsheet software since they can perform functions to speed up simple arithmetic calculations. You will learn simple formulas, such as addition and multiplication, as well as exponentials. It is here where I became stuck with one particular exercise when required to link multiple functions together (see bullet point 3 in the image below). I was asked to change 65 to 7 plus 2 to the power 2, and from this value subtract 16. I was told the answer would be 65, however, when I read the task I would perform (7 + 2^2)-16 which obviously gives -5. 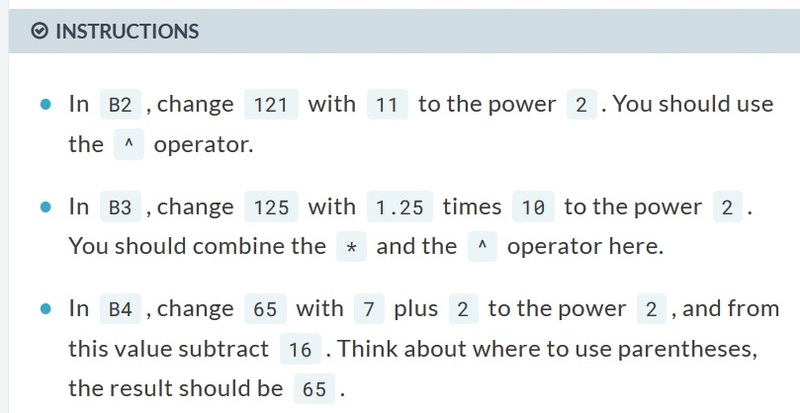 Maybe it was the way I was reading the task, basically doing as it says, however, the objective was to think about using the parentheses and functions to get the answer 65, as opposed to simply doing as the task read. I felt it wasn’t clear while reading the first line of this task that the idea was to solve the equation to reach the desired answer. Just a small minor though. The next exercises require you to further decide which functions to use and in what order to satisfy the problem in the task. This will enable you to think more about what it is you’re doing instead of relying on step-by-step instructions. The first chapter will finish off with an introduction to some of the different data types you can enter into a spreadsheet: text, numbers, currency and dates. The exercise will also prompt you to create an error in a cell which will give you a warning. This is especially useful as it teaches you about identifying when formulas go wrong (as they often do!) and how to go about rectifying the problem by using the recommended help in Google Sheets. The second chapter focusses on references. So using the formulas learnt in the previous chapter, you will start to apply these to multiple cells. It is here that you will also be shown the useful feature of dragging functions around within spreadsheets to copy functions and patterns into neighbouring cells – something that will save you valuable time. In the final task, you are asked to combine everything you had learnt in the final chapter and apply this to solve a series of tasks. This worked very well to conclude and recall everything I had learnt on the short course. All in all, the course took me less than 1 hour from start to finish. This was obviously because I already had spreadsheet experience and was comfortable with most of the content. Despite this, I actually did learn something new (the use of the $ symbol to keep a cell constant in formulas). Depending on your goals, the majority of people with spreadsheet experience will find this course trivial and quite pointless. But for those who have never used Excel, this is certainly the best place to start your journey. The course was entirely free to use and replay! The use of Google Sheets enabled the ability to download the worksheets to practice in Excel. The lack of video content. I feel incorporating some videos, especially at the start of each chapter, may have been a better way to introduce the content and set the scene. Minor confusion with one particular task. *Disclaimer: these links contain an affiliated link. These links do not affect your experience with DataCamp. Simply, we will earn a commission if any sales result when clicked. Despite these inclusions, my review is based on my own personal experience with the course. DataCamp's Spreadsheet Basics is a must for those with no or very little spreadsheet experience. And the best bit is it is totally free to do!